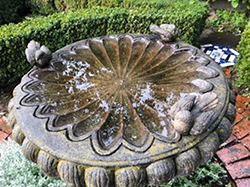 Overhanging trees are reflected in the still face of the birdbath at the center of the hedge garden at Center in the San Francisco Bay Area. 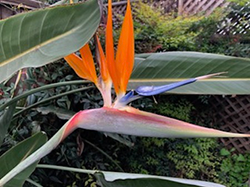 Dramatic Bird of Paradise draws attention to the back corner of the garden. 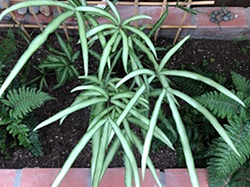 Pteris ferns arch gracefully along the brick planter near the entrance to the meditation hall. 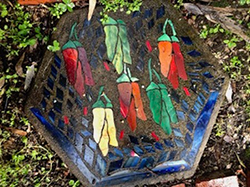 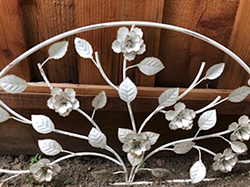 Found hidden in overgrowth, this painted metal design piece now adorns the walkway along the side of the garden. 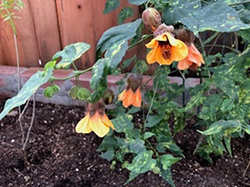 Chinese Lantern flower graces the left side of the fern garden.